TUZLA, Bosnia-Herzegovina – More than 2,300 Bosniak refugees took advantage of a ceasefire and a rare relief convoy Monday to flee the cold, hunger and encircling Serb force at the eastern Bosnian enclave of Srebrenica. The refugees – women, children and old men – were packed so tightly into the 19 U.N. trucks that they had to stand on their luggage. But they waved with relief as they reached safety in the Bosnian government-held city of Tuzla. Some apparently died en route. Tales were common of people falling off the trucks – many of them open vehicles – as they traveled all day to reach Tuzla, 45 miles to the northwest. “I have no one, I have no one,” sobbed 70-year-old Hajra Bosankic, lying on her side, safe, in the sports hall converted to a refugee center. She said one son was killed by Serbs. She did not know where her other five children were. A teen-age granddaughter fell out of a truck as it left Srebrenica, Bosankic said. A sandwich left by aid workers lay untouched by her belongings. Sefika Mehic cried uncontrollably, holding her feet and rocking. She said her month-old baby turned yellow and apparently died en route. Doctors rushed the child away upon arrival, and she had heard no further. Relief workers were seen pulling a blanket over the face of an old man who died en route. 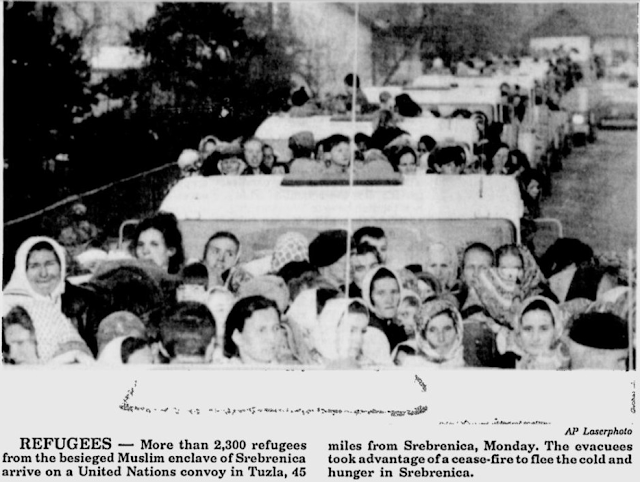 The cease-fire has been the most successful so far of the nearly year-long Bosnian genocide. It went into effect at noon Sunday, and U.N. officials reported no major violations. The agreement by the Bosnian Serbs for the cease-fire, a convoy into Srebrenica and the evacuation out of the town came as the international community turned up pressure recently for a settlement. The convoy of food and medicine was only the second into Srebrenica since Dec. 10. The war broke out last April 6 over a vote for independence by Bosnia’s Bosniaks and Croats. It has left at least 134,000 people dead and missing.